Here's the scenario, you're a busy executive working away from your office and you just want to quickly research something on the Web. You turn on the company-provided notebook computer and you wait the standard 3-6 minute delay, before you can actually use it. The corporate IT department has numerous mandatory processes that must load first -- such as virus protection, data backup, system and app software updates, etc. -- on a typical Windows system. That's often dozens of processes running at start-up, and some will consume 100 percent of the available processing power. That automated cycle can temporarily incapacitate a notebook PC. Don't bother attempting to load a web browser while this PC start-up sequence is in motion. What's the alternative? If you have a media tablet, simply use it instead and you're on the Web in a matter of seconds. Is your company prepared for the pending business tablet invasion that will likely raise the bar of expectations for corporate mobile computing? Ready or not, this trend is already in motion. Cisco announced findings from a global survey of IT managers' perceptions about tablet form-factor mobile devices in the enterprise. Cisco commissioned Redshift Research to perform a market study to assess attitudes, fears and hopes for media tablets in the workplace from a survey of more than 1500 IT managers and executives in the U.S., Canada, UK, France, Germany and Spain. 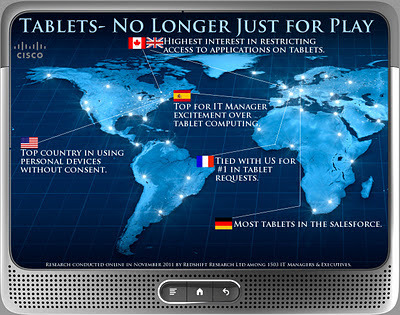 While it's still considered a nascent market, this year we'll surely see an increase in the adoption of business-oriented tablet computing. Which countries lead? Of the countries surveyed, the US and France are tied for tops -- each report a tablet is requested by 21% of the workforce. Senior executives are most likely to be issued a tablet in the US (38%) and least likely to be issued one in the UK (27 percent). Turning a blind eye to BYOD. Globally, 48% said their company would never authorize employees to bring their own devices to work, yet 57% agreed that some employees use personal devices without consent. "Mobile workers and virtual workspaces are here to stay -- but so are the demands on IT to continue to ensure enterprise-grade security, manageability and interoperability. 2012 promises to be an exciting year and IT leaders are a critical component in unleashing innovation and enabling organizations to take advantage of the next wave of business growth and opportunity. Cisco is keenly focused on helping its customers navigate the post-PC era and transform their business," said Tom Puorro, director of product management, IPCBU, Cisco Systems. Survey respondents were from a wide variety of global companies and are either primary IT decision makers or play a key role in the procurement process. Sole proprietors were excluded from the study. Field work was conducted in late 2011. Multinational company CEOs are one of the most vocal advocates of the managed cloud services phenomenon. Many have been through the painful process of watching helplessly as their CIO championed the deployment of monolithic ERP and CRM systems -- only to discover that these huge enterprise software projects failed to live up to their promise. Meanwhile, purposeful line-of-business executives have successfully utilized software-as-a-service (SaaS), with their CEO's support, to break free from the legacy IT platforms and thereby give their employees the business technology (BT) productivity tools that they had hoped for -- or that the power-users demanded. Forward-looking vendors and prescient BT service providers are now leading the transition to the next wave of productivity-enhancing and cost-reducing platforms. Next year, we'll likely witness increased market activity, as the next chapter of this story unfolds. In anticipation, Cisco has pro-actively presented its cloud strategic plan and tactical roadmap to both eager channel partners and savvy enterprise customers. Cisco CloudVerse is a framework that combines the foundational elements needed to enable organizations to build, manage and connect public, private and hybrid clouds. Cisco CloudVerse combines these key cloud elements -- Unified Data Center, Cloud Intelligent Network, and Cloud Applications and Services -- enabling businesses to realize all of the benefits of clouds: improved agility, better economics, enhanced security and a dynamic, assured experience. The Cisco Cloud Index, issued last week, forecasts how dramatically clouds are transforming business IT and consumer services. The study predicts that over 50 percent of computing workloads in data centers will be cloud-based by 2014, and that global cloud traffic will grow over 12 times by 2015, to 1.6 zettabytes per year -- the equivalent of over four days of business-class video for every person on earth. The insightful study suggests that the explosive growth in clouds requires advanced capabilities that allow the data center and network to work together -- to support end-to-end cloud application delivery. Today, most cloud technologies exist in silos, preventing an efficient, integrated management approach. 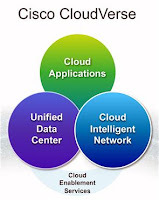 By integrating the three foundational cloud elements -- the Cisco Unified Data Center with the Cisco Intelligent Network to enable Cloud Applications and Services -- CloudVerse delivers a business-class cloud experience within the cloud, between clouds, and beyond the cloud to the end user. A large number of enterprises, service providers, and governments have announced that they are adopting Cisco CloudVerse as the foundation of their cloud strategies, including ACS, a Xerox Company; Fujitsu; NWN; LinkedIn; Orange Business Services; Qualcomm; Silicon Valley Bank; Telecom Italia; Telefónica S.A.; Telstra; and Terremark, a Verizon Company. Today over 70 percent of leading cloud providers are using Cisco CloudVerse on their journey to the cloud. "We're moving to a world where our business customers want to experience services anywhere, anytime on any device. Cisco CloudVerse is architected to help deliver on the promise of cloud by unifying compute, storage and network resources that can be securely and rapidly re-purposed and managed on-demand to meet the needs of different customers or applications. These capabilities are fundamental to the cloud and the Cisco Cloud Intelligent Network is purpose-built to help deliver the security, scalability and flexibility we need," said Kerry Bailey, Terremark, a Verizon Company. Cisco Intelligent Automation for the Cloud is designed to provide automated provisioning and management of data center resources for the delivery of cloud services within and between data centers. Cisco Network Services Manager is designed to automatically create, deploy and modify physical and virtual networking resources on demand. "Cloud-to-Cloud Connect," featuring the Cisco Network Positioning System on the ASR 1000 and 9000 Series Aggregation Services Routersin 2012, will enable dynamic resource identification, allocation and optimization between data centers and clouds. Private Cloud HCS empowers enterprises to build their own collaboration cloud using Cisco's validated and tested solution and full management capabilities. Mobile HCS provides mobile service providers with an easy and cost-effective way to offer collaboration from the cloud, thus extending services from "fixed" devices to mobile phones. For example, providers can virtually connect thousands of mobile users at a company with single-number reach, or enable customers to transition a call from a desk phone to a mobile phone while the call is in progress. Customer Collaboration makes contact center capabilities more affordable and accessible by adding Cisco Customer Collaboration offerings to HCS. These offerings are available on a limited basis now and targeted for general availability in 2012.